and hence any distortions in either a body's distance in physical length or its time of travel due to relativistic effects of motion will have be accounted for, so to speak, by a "correction factor" which we will soon see. 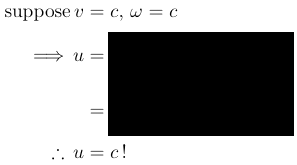 How to solve this problem of Addition of Relativistic Velocities will now become the subject of the following discussion. is moving away from with relative velocity . 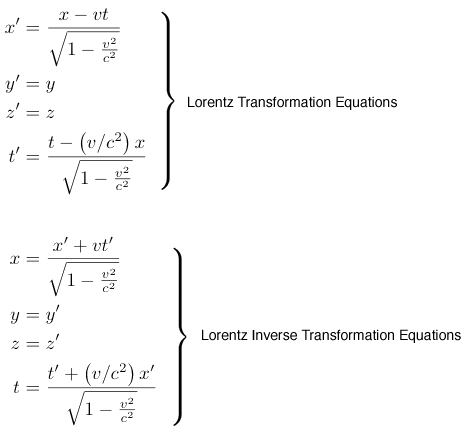 In other words, any successive Lorentz transformations will be equivalent to one (1) Lorentz transformation and hence demonstrating the invariance of the Lorentz Transformation Equations as prescribed by Special Relativity [ see: The Relativity Physics Postulates - The Principle of Relativity ]. Let's suppose that system is a space ship and that some body object residing inside is actually system . 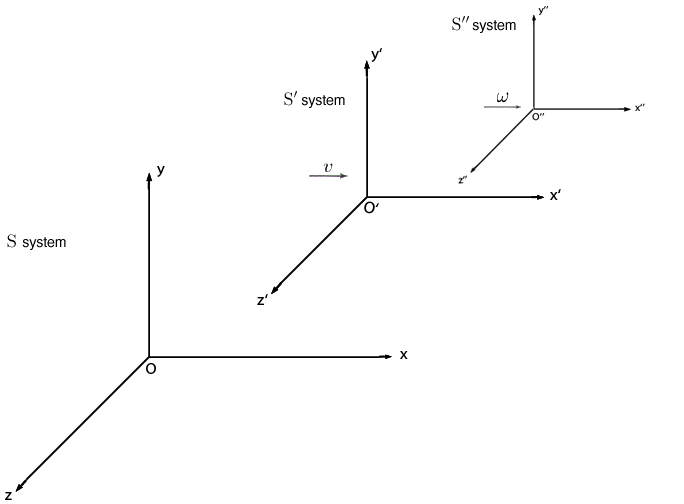 that is, there is no Lorentz velocity or length contraction and everything goes over into classical Galilean Transformation Equations! 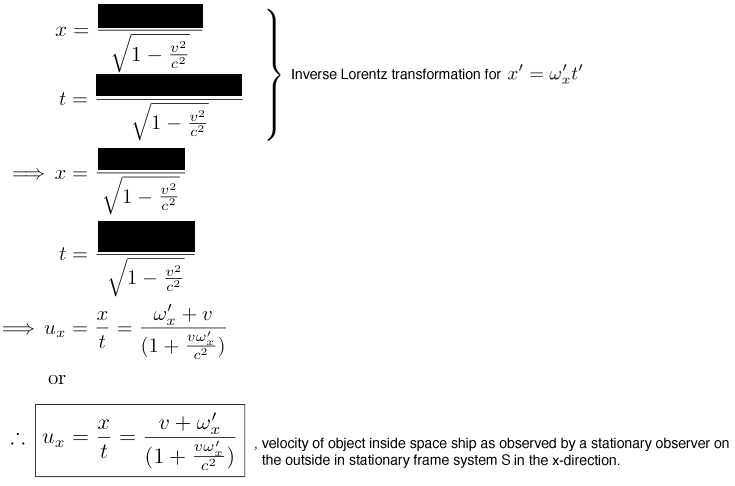 In other words, it is virtually impossible to combine several Lorentz transformations into one final transformed coordinate system where there will be a relative velocity greater than as long as in at least one inertial system no object body [ or mass - particle ] travels faster than . 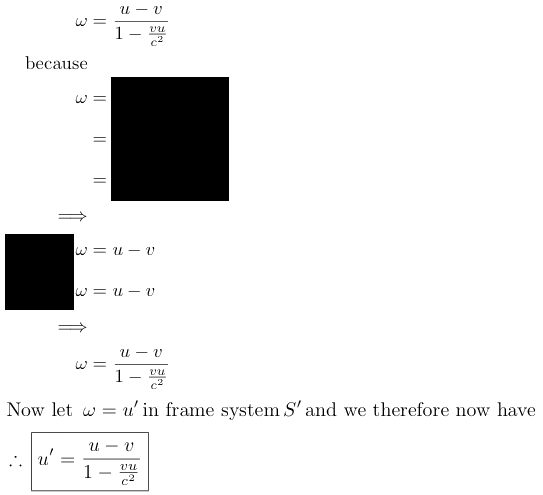 And, of course, it will always be possible to describe one inertial system in which a given body is traveling less than or equal to since The Principle of Relativity [ see: The Relativity Postulates ] is á priori always true. 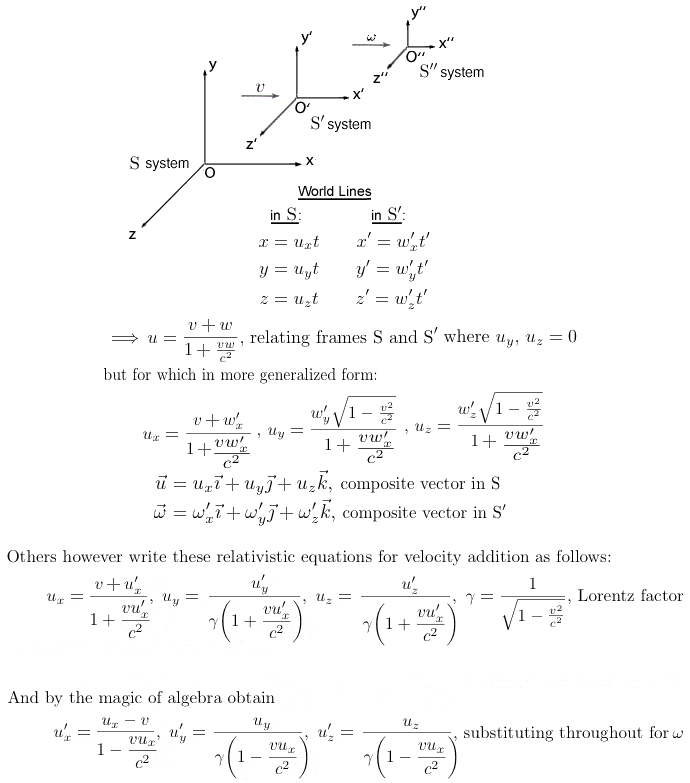 every material body will have a velocity less than or equal to in every other inertial system if its velocity in any one inertial system is also less than or equal to . Let be the velocity vector of a rocket as observed in relatively stationary traveling at, say, 0.6 with theta angle of, for example, 30°. Also, let move away from stationary at = 0.1 . Let be the speed of light with a directed beam having theta angle of 30°. Also, let move away from stationary at the same = 0.1 . In other words, everything is the same as above but we now substitute the speed of light for the rocket and its velocity. 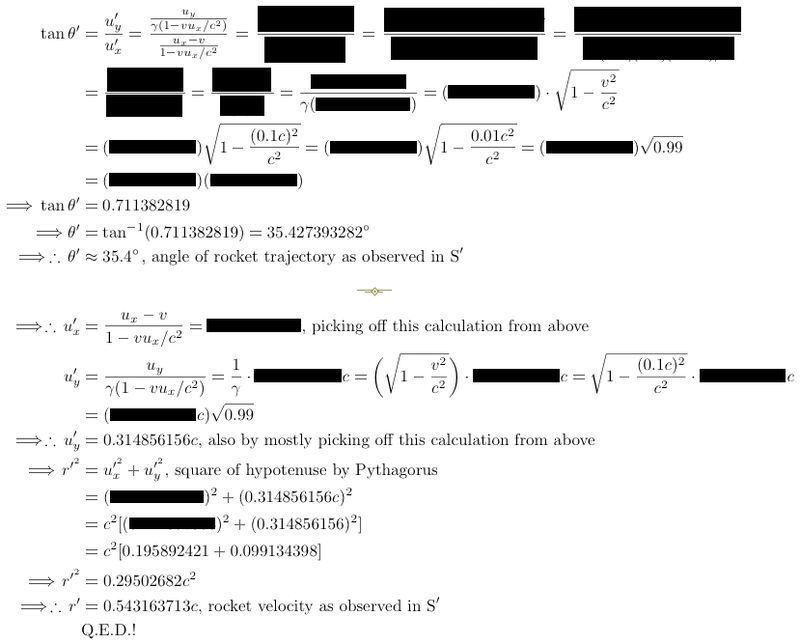 As before, we now calculate the speed of light and angle of the entering light as observed in . 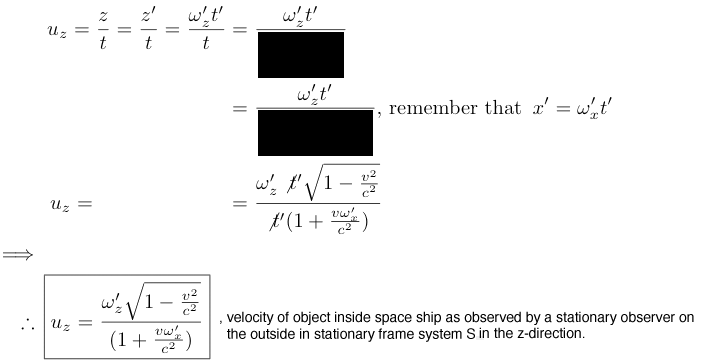 Remember that since light is diffuse throughout a given volume of pure vacuum space devoid of matter, it does not possess a unique direction and therefore light only possesses speed and is not a vector. But in our situation, we are prescribing a directed beam such as a laser. 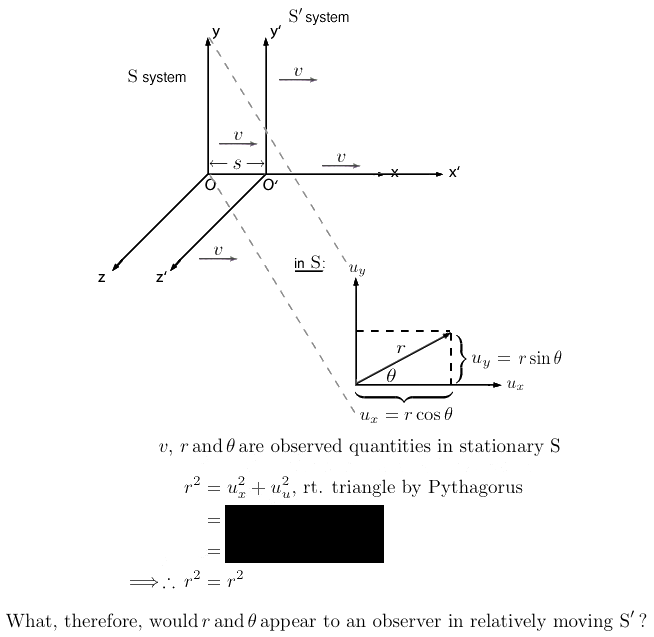 Aside from the philosophic questions of time and mass dilations arising from relativistic addition of velocities, we also observe from the above examples that there exists a "pseudo - rotation" in spacetime geometry of the velocities observed in as compared to relatively stationary . 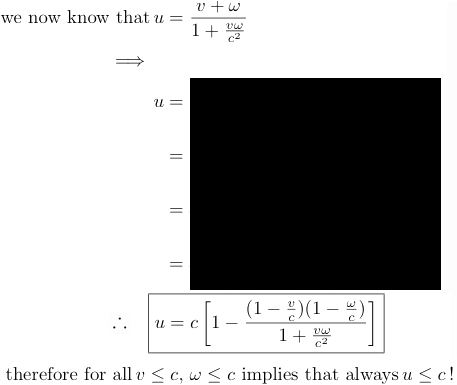 For this and other geometries being shown here, please go to Minkowski's "Light Cone" wherein it's also shown that we humans live in a "45° physical reality of knowing" beyond which there is cosmological Elsewhere. In other words, our human perceptions of external reality can tell us only a limited amount of truth regarding the external world. At a deeper level of understanding, therefore, it is only by means of philosophic and mathematical inquiry that an observer in and can relate their "experiences" to each other beyond what their respective naïve perceptions will tell them. 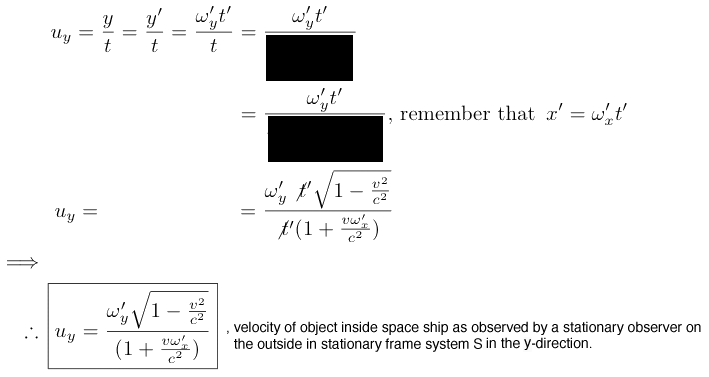 To the observer in there is one sort of angle of velocity motion but to the other observer in there is another, but different, angle of velocity motion; whereas, hence, neither would realize that their respective angle of velocity motion differs from the other except by deeper philosophic and mathematical inquiry.